1960- 1965 Westly Windsor apprenticed to AA Bond & Son, Watchmakers and Jewellers Waltham Abbey, Essex England. 1970 Migrated to Australia and worked in the trade in Melbourne. 1976 B.H.C.S. set up in Mont Albert servicing private clientele and the trade including clock maker for 'Palmer's, The Jewellers' of Glenferrie Rd., Malvern. In recent times we have become specialists in the sale and repair of cuckoo clocks as well as continuing to service all antique and modern timepieces. New mechanical and quartz movements can be supplied and / or fitted from large 'grandfather' chiming styles to miniature timepieces. 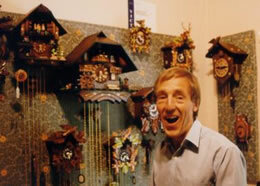 Our cuckoo clocks are imported from the manufacturers in the Black Forest, Germany. If we do not have the exact style for your requirement, in stock , we can have orders air freighted within three to four weeks and all are covered by our personal Two Year Guarantee.